MFG Talk Radio published quite a few of our pieces lately. They shared news of our new technology, the LAN-USB Connect. 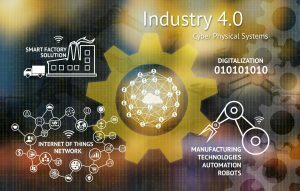 They also shared a piece where we shared with manufacturers how to approach decision makers with ways to prove automation ROI. FabShop Magazine hosted SFA in the MFG ETC section once again. OSHA’s Top 10 safety violations in 2017 that apply to the shop floor were explored and how some automation solutions can help address some of these issues for 2018 onward. 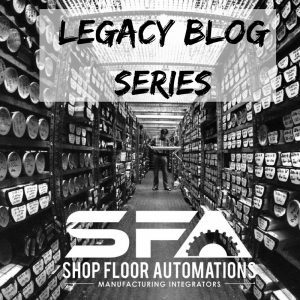 In a throwback, Manufacturing Engineering published a blog about managing and collecting shop floor machine data. Within this piece, SFA owner Greg Mercurio was interviewed. For our latest appearances in manufacturing trade magazines, check out our press page. Otherwise, we would love to start the conversation with you about automation! Call (877) 611-5825 or fill out a contact form. When working production on a manufacturing shop floor, productivity issues happen. Nothing is perfect – this includes your employees and equipment. Some leaders may automatically assume that machinists are to blame for productivity decreases. They think they are not doing their job since they are directly handling the machines. Before we jump to this conclusion, we need to ask if we are being fair. Especially to skilled workers who are the backbone of the manufacturing industry. With this in mind, here are three productivity problems and the tools you can use to combat each of them. Read on for more! 2018 is coming up fast. What are your main concerns with your manufacturing production? 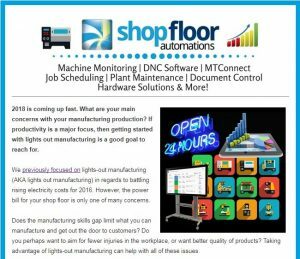 If productivity is a major focus, then getting started with lights out manufacturing is a good goal to reach for. We previously focused on lights-out manufacturing (AKA lights out manufacturing) in regards to battling rising electricity costs for 2016. However, the power bill for your shop floor is only one of many concerns. Does the manufacturing skills gap limit what you can manufacture and get out the door to customers? Do you perhaps want to aim for fewer injuries in the workplace, or want better quality of products? Taking advantage of lights-out manufacturing can help with all of these issues. 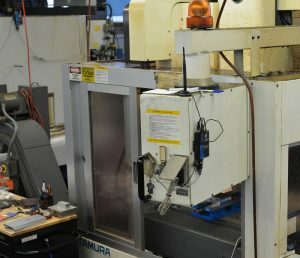 One crucial part of adopting lights-out manufacturing in your shop helps to minimize labor costs for each part you make, which in turn helps you compete on a global level. This helps the Made in America movement grow stronger while increasing your profits and customer base. Put in a request for more info on lights-out manufacturing by calling (877) 611-5825! You can also fill out a request for info form here. Link to original newsletter here. Manufacturing costs are a pain. MFG costs and budget comes into play whenever productivity improvements are considered. Costs are sadly not predictable. Fixed Costs: You get in your car, you set up your GPS and map out the trip to avoid tolls. You know how much time it will take to get there and how many miles. 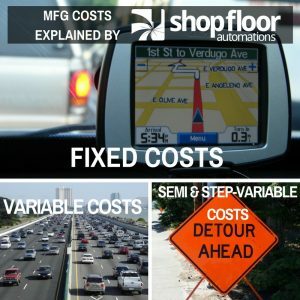 Fixed costs are part of the routine in manufacturing. These cover utility bills, taxes, property costs, and salaries (not counting commission). This also includes office supplies, too. Variable Costs: When you plan to take your trip, you account for normal traffic patterns that will add a likely delay. It’s an annoyance we have come to both accept and expect for road trips. 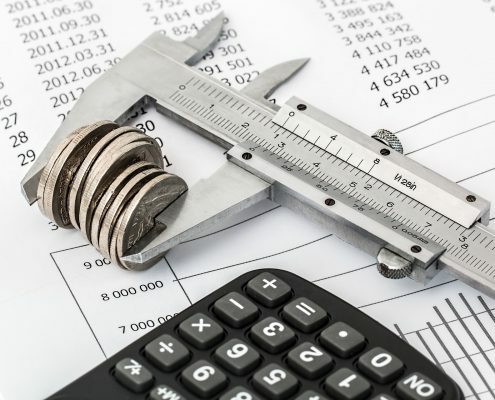 Variable costs can best be described as costs directly in relation to production. For example – when you produce more, you ultimately need more raw materials. These patterns are predictable – remember the old saying “you gotta spend money to make money”? Semi-Variable & Step-Variable Costs: When you’re on your trip, let’s say a horrific accident happens, or you hit an unexpected detour. These unforeseen but likely scenarios can add time to your trip. Semi-variable costs account for costs that can vary. This includes commissions for salespeople or production-based bonuses. Step-variable costs, however, are costs that remain fixed for a period of time, and can suddenly spike up. Unexpected machine downtime, for example, costs money due to stopped production. You may even have to hire a specialist to come out or replace it with another machine. What is the common factor in all of these examples, though? If you invested in the GPS, it will reroute you, or add time to your route when you hit traffic or unexpected snags in the road. It is monitoring conditions for you to give you expectations and suggestions on how to improve your route. How does this relate to manufacturing integration solutions & ROI? Investing in manufacturing integration solutions is the best ROI when taking into account situations that lead to step-variable costs in your production. It’s essentially giving yourself a GPS to help meet and exceed production goals. 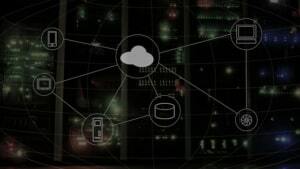 If your machines are consistently having communication errors that cause thousands of dollars in stopped production time, then DNC software or hardware is a drop in the bucket to help prevent this from happening. 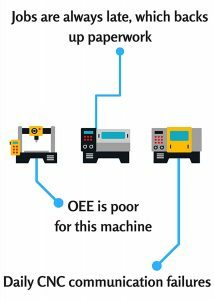 If there are other issues with machines causing downtime that are not relative to CNC communication failures, then machine monitoring can help for better OEE and for machinists to better communicate issues for proper solutions. 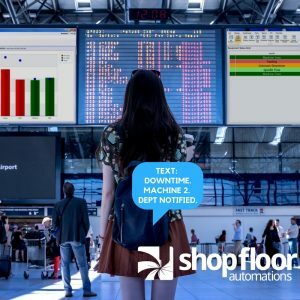 Get in touch with Shop Floor Automations for more insight! You can fill out a form here, or call us at (877) 611-5825.